A police officer was attacked while dealing with a domestic incident at a house in Sheffield. The officer, who works for the Sheffield North East neighbourhood policing team, which covers areas including Parson Cross, Firth Park and Pitsmoor, was called to one of six domestic incidents dealt with by the team last night. 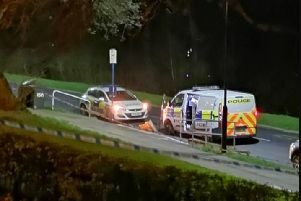 South Yorkshire Police said that because of ‘short staffing’ issues and ‘high demand’ officers were sent to incidents ‘single crewed’ rather than with a colleague for assistance. At one of the incidents an officer was assaulted before a dog handler arrived to assist in the arrest of the ‘violent suspect,’ the force said. In another incident, a police officer had to use an incapacitant spray to apprehend an 'aggressive’ man.